Visiting the Sacred Monkey Forest Sanctuary in Ubud was nothing short of a magical experience for this Southern girl! It’s so different from any place I’ve seen in the U.S., and it's the first spot I recommend to anyone planning a trip to Bali. The sanctuary is hidden amongst terraced rice paddies deep in the jungle of Ubud and is filled with friendly, yet mischievous scampering monkeys. 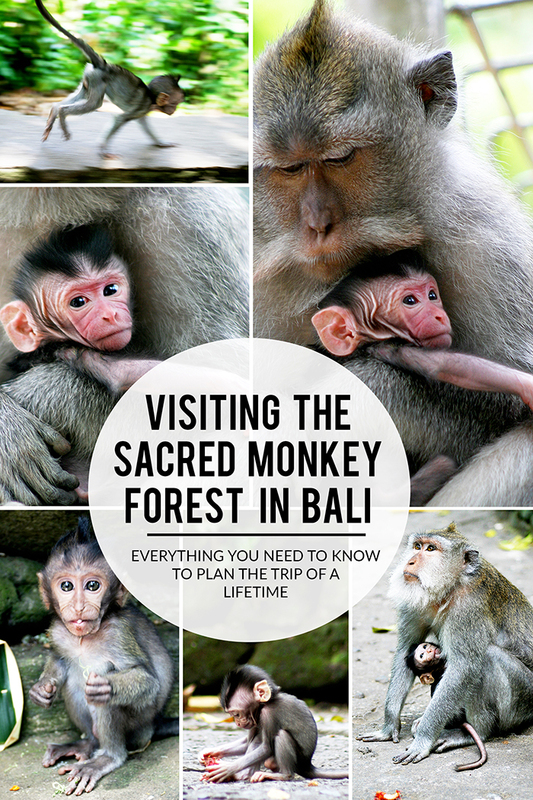 If you find my tips about the Sacred Monkey Forest helpful, please share this image on Pinterest. The main road in Ubud is often referred to as “Monkey Forest Road”, and it leads directly into the gateway of the forest. It's easy to tell when you're approaching the sanctuary, because you'll spot numerous monkeys near the local storefronts. TIP: Ask to be dropped off at what is locally known as “Monkey Forest Road” in Ubud, and any local will be able to point you in the right direction. Click on any photo to view it larger or to learn more. Unlike U.S. zoos or wildlife ranches, the monkey forest is not completely enclosed. The monkeys can dart in and out of the entrance if they chose to do so — and boy, do they! They’re playful little creatures that constantly seek out food and mischief. The store owners seemed to have a love/hate relationship with them and playfully shoo them back into the forest. Entry fees to the sanctuary are similar to the cost of a typical zoo visit in the U.S. For well under $10 in U.S. currency, you can obtain a couple entry tickets and purchase bananas to feed the monkeys. There are currency exchange shops located near the entryway if you need to swap dollar bills for rupiah (the local currency). TIP: You may pay higher fees if you wait to do this near the gates, so I’d suggest locating an exchange on one of the streets further away from the sanctuary entrance. They're particularly drawn to sparkly silver eyeshadow and hoop earrings. If you prefer not to have a distractingly cute team of monkeys pickpocketing you, tuck important items deep inside your clothing or zip them away in a locked bag. That includes wedding rings, earrings, sunglasses, and hats. TIP: You can also check items at the entry for a nominal fee when purchasing your ticket, then pick them up when you leave. Forest guides often entertain visitors with amusing stories about tracking down items innocently “stolen” from guests by naughty monkeys. Employees then have to climb high into the tree canopies to retrieve said stolen items. It’s a safety issue not only for the monkeys, but also for the guides who do the climbing. Please be kind and safely stow anything that could be of interest to the little critters. If you’re traveling with kids, I’d suggest having one parent hold the bananas and the other stand a few steps away with the kids. I don't recommend allowing children to feed the monkeys, since they're such unpredictable wild animals. (The monkeys, not the children. Although in some instances…. 😉) Instead, toss bananas close enough so the kids can get a good view of them enjoying their treats. The monkeys appear conditioned to expect food closer to the entryway and aren't as aggressive deeper into the sanctuary. It's possible they may tug on you once you're deeper into the forest, but if they don’t smell bananas they'll quickly scoot away. TIP: Never tease a monkey by offering food, then taking (or pretending to take) it away. They may react aggressively! Also, never attempt to stare down a monkey. Sometimes the monkeys accidentally scratch a tourist while climbing on them, and they'll even bite on occasion. Don't believe me? Try searching YouTube for “Monkey Attacks in Ubud” or similar terms. However…please don't let that scare you away from visiting this majestic sanctuary! 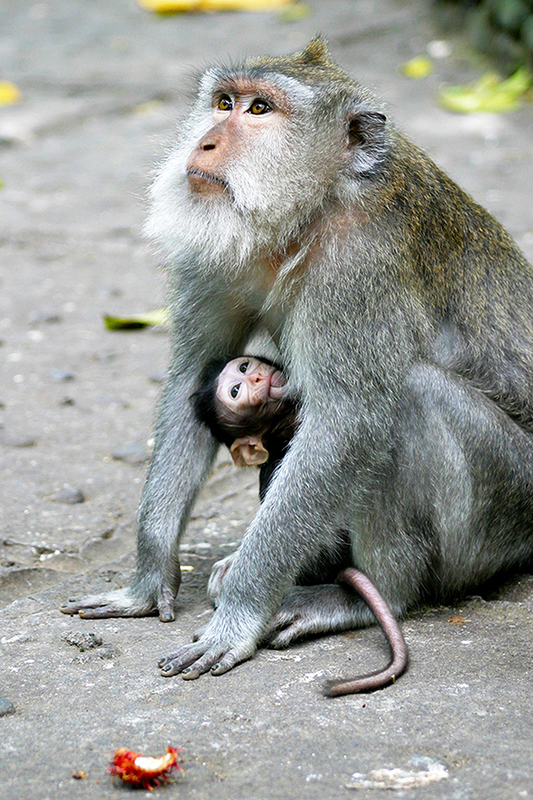 The monkeys in Ubud have grown up around tourists and are comfortable interacting with humans. Just use common sense to avoid having issues and respect the fact that you're dealing with territorial wild animals. Some people consider the monkeys aggressive, while others find them exceedingly friendly; I think it depends on your comfort level with wild animals. I found them very friendly and likable, but that's because I used common sense and didn't attempt to provoke them. TIP: Prior to your trip, speak with your doctor about the possibility of a preventative rabies vaccination. If you are scratched or bitten during your visit, seek local medical attention at once. Rabies can be deadly and the signs may not show immediately. The monkey forest sanctuary is a nature reserve and is also home to three Hindu temples. As such, it is considered a sacred area, so please be respectful upon entering the sanctuary. Don't dress in crop tops, skimpy spaghetti straps, or distasteful t-shirts. It is very hot in Ubud, so sarongs or long, loose pants work best for the ladies. Men often wear shorts and loose fitting tops. Approximately 90% of Balinese people are Hindu and the remaining 10% are Muslim or practice Buddhism or Christianity. Hotel Kamandalu – Kamandalu has the most attentive and caring hotel staff of any resort I've visited. They ensured my stay was more incredible than I ever thought possible. The villas feel completely private, yet they open up to beautiful, sweeping jungle views. Each villa is its own private oasis, with individual pools overlooking the jungle, a private outdoor shower, and courtyards filled with tropical local Frangipani flowers. Read all about my stay here: Hotel Review: Kamandalu Resort in Ubud, Bali. Viceroy – I didn't stay at The Viceroy, but I did stop in to take a peek around. It's a bit pricier than Kamandalu, but it's located along the same jungle river bluff and has similar views. Even as a visitor, the staff was hospitable, welcoming, and attended to my every need. Each private villa overlooks the jungle and lush, green terraced rice paddies. If you have any questions at all about where to stay in Ubud, I'm happy to help! You can reach me via the contact me page. I could go into extreme detail about the Balinese long-tailed monkey, as well as the temples found within the sanctuary, but I see no point in repeating the excellent information located on the sanctuary’s official website: Monkey Forest Ubud. Before I go, I'll leave you with a few of my favorite shots from the trip. Look at those tiny little fingers! So precious. Oh, and the mohawk! This may be my favorite shot from the trip. I loved seeing how snuggly and protective they were of one another. The wrinkles surrounding that tiny little face get to me every time! Can you believe how giant their ears are? How incredible is this shot of a mom nursing her baby? Their eyes are so warm and inquisitive. 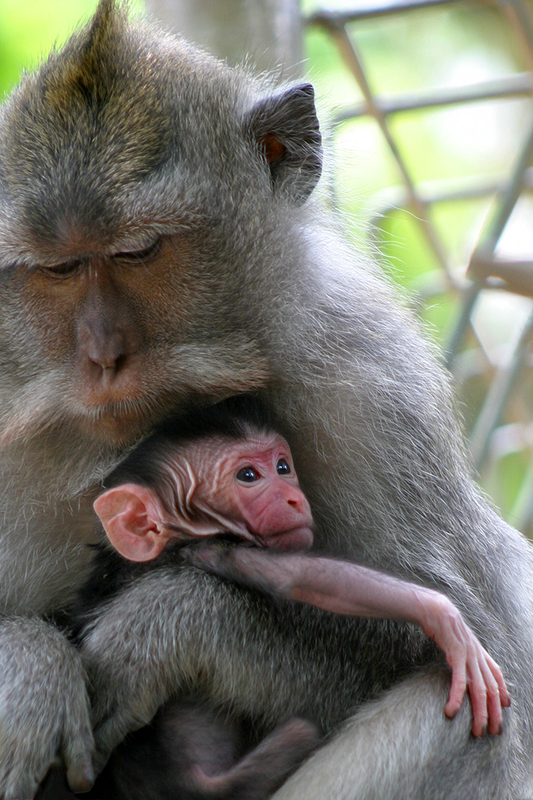 The Monkey Forest Sanctuary tops my list of things to do in Ubud, Bali. 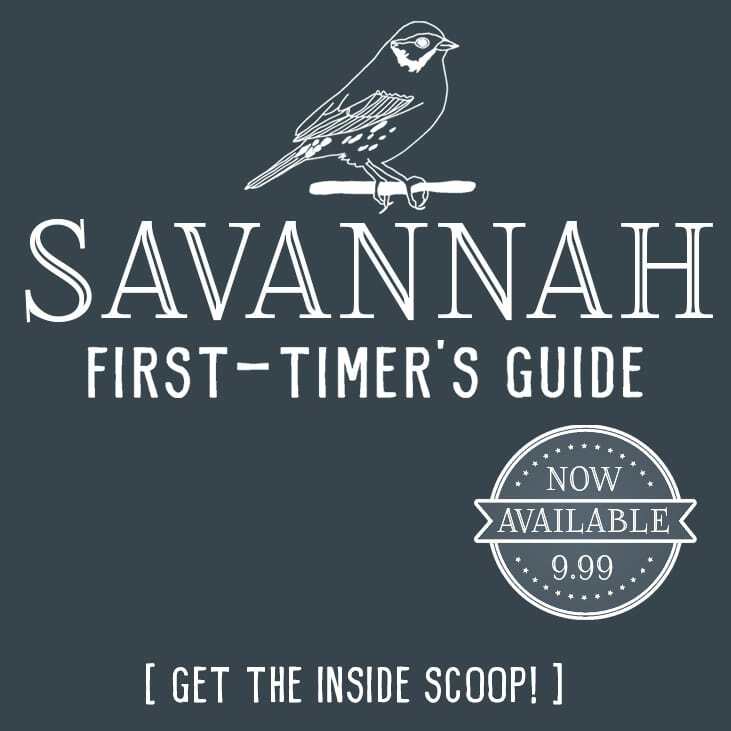 If you're planning a trip to the area, I highly recommend including it on your itinerary! Please let me know if you have any questions at all or need help planning your trip. And if you're fortunate enough to have visited the monkey forest, please share your tips below so we can all benefit from your experience! Great tips, girl! I love that you included being respectful in what you wear – many people don’t realise that it’s a sacred area. HOW FUN! I can’t believe how cute those little monkeys are! I stayed in Ubud last year and visited this place! 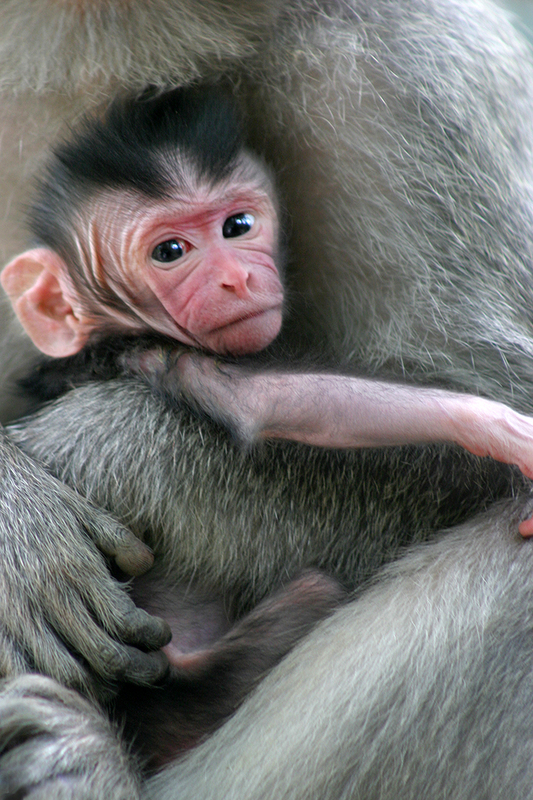 I totally fell in love with all the baby monkeys. Your photos brought back some wonderful memories! I fell in love with them, too, and with Ubud in general. It’s such a beautiful little town and the people are amongst the friendliest and most peaceful people I’ve met during all my travels. I hope I can go back one day! The baby faces are the cutest 🙂 They’re so inquisitive! They really are intelligent little creatures. It’s fun to find a spot to just sit and watch them interact with one another and with the visitors! Thank you! They were fun to photograph. 🙂 I hope you make it to Bali someday. This looks like a priceless life experience. 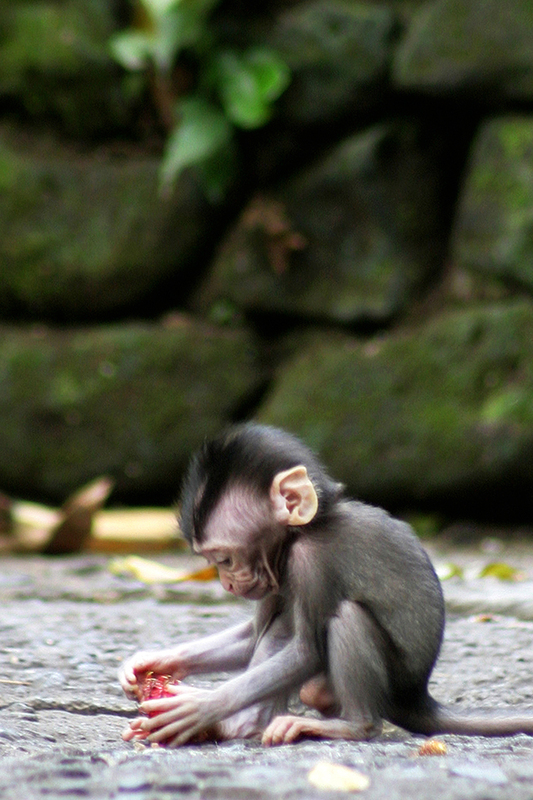 Those monkeys are adorable, and this is one of the many reasons traveling to Bali is on my bucket list. It’s a great bucket list item! I had so much fun. 🙂 I hope you make it there one day! What a beautiful place to visit! It looks gorgeous and the monkeys…adorable! Hi Judy! The monkeys were adorable little troublemakers. 🙂 Bali (as a whole, not only the monkey jungle) is my favorite place I’ve ever visited! Have a great weekend.